The EMC VNX family delivers industry-leading innovation and enterprise capabilities for file and block storage in a scalable, easy-to-use unified storage solution. VNX storage combines powerful and flexible hardware with advanced efficiency, management, and protection software to meet your economical, and performance needs. With the VNX you can consolidate multiple workloads and still enjoy the best economics for yoru virtual and physical applications without compromise. 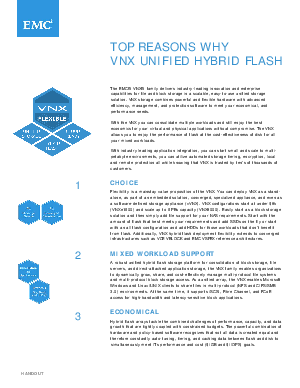 The VNX allows you to enjoy the performance of flash at the cost-effectiveness of disk for all your mixed workloads. With industry leading application integration, you can start small and scale to multi-petabyte environments, you can utilize automated storage tiering, encryption, local and remote protection all while knowing that VNX is trusted by tens of thousands of customers.